As we said before, the video is gaining more and more popularity amongst social networks, whether we are talking about leisure ones or business ones, and here we are talking about video ads. Whereas other social networks have embraced the video trend long before, LinkedIn just introduced native auto-play video ads format, which will appear as stand-alone posts within the network. The change is welcomed, as until now, the only way to incorporate videos on LinkedIn was through other websites. The video format will be the same as on other platforms, meaning it will roll out without sound, but has the possibility to unmute it. LinkedIn representatives said they have been testing the new feature with over 700 advertisers since last October and they have seen an increase in the engagement even three times longer than with the other types of sponsored content. Abhishek Shrivastava, director of product for LinkedIn Marketing Solutions, said that the new sponsored video ads are suitable both for building brand awareness and for leading sales. The benefit of introducing the new feature for advertisers is the niche. Whilst the other social networks mainly concentrate on B2C, LinkedIn, by its nature, focuses on B2B. When launching a video sponsored campaign, marketers can incorporate ad targeting to be sure their video reaches the desired audience and conversion trackers to see how the ad worked. 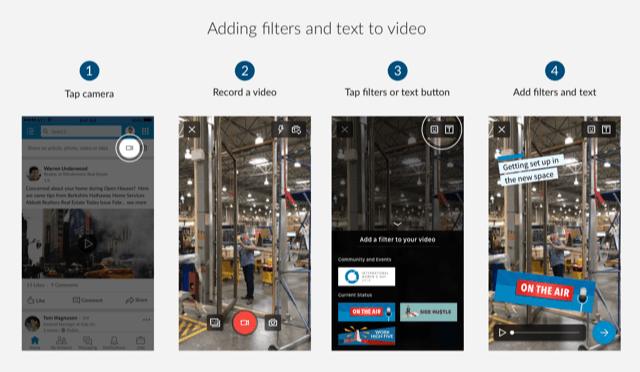 Earlier this month LinkedIn announced improvements to videos, such as the possibility of adding filters and text, just as you do with the Stories-type video. In order to do this, you must use the mobile app, record a video and then simply add the elements that you want from a series of pre-defined filters and a text that expresses your thoughts. Besides the new video ads feature, LinkedIn also introduced the possibility for brands on their network to share native videos to their company page. This is more used to promote company values, to show workplaces and the atmosphere there. What do you think of the newest LinkedIn auto-play video Ads updates? Do you use this platform in your digital strategy? See also: How to Use Linkedin for Business and Marketing?